Author: Duncan Okoth Okombo. Series edited by: M. Lionel Bender †, Franz Rottland †. 8 pp. Roman, 177 pp. Dholuo (Luo) belongs to the Western Nilotic sub-branch of the Nilotic branch of the Eastern Sudanic family. Of the Nilotic languages in Kenya only Dholuo, spoken by about 4 million people (2009 census), belongs to the Western Nilotic group. Languages closely related to it are found in Uganda and the Sudan. 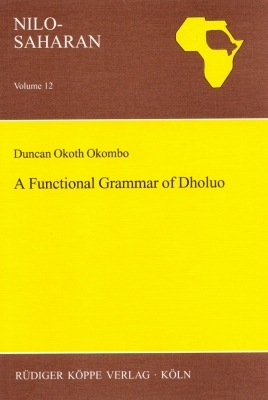 Following the theoretical tenets of Functional Grammar, the present volume is a study with a two-fold aim: First, it sets out to provide a descriptively adequate account of constituent order in Dholuo; secondly, it investigates the possibility of providing such an account without using transformational rules in the sense of structure-changing operations.